Could it be any simpler, more direct or true? 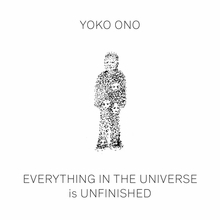 Captioned, "Add color where the world needs peace," this image is reproduced from Yoko Ono's new clothbound Grapefruit-sized artist's book, Everything in the Universe Is Unfinished, just out from JRP|Ringier. Elsewhere she asks, "What can a pen do?" And states, "Believe in yourself and you will change the world." Clth, 5.5 x 5.5 in. / 48 pgs / 13 b&w.